This past Saturday, we drove down to Santa Clara for this year’s California Extreme, a celebration of classic arcade gaming featuring dozens of video game cabinets, pinball tables, and other amusements brought in by private collectors. There’s an entry fee—we paid $40 a head at the door—but afterward, all of the games are free to play. In addition, CA Extreme features a few panels, evening concerts, and a handful of vendors selling everything from old console games to pinball machine parts. The range of arcade games, spread across two conference rooms in a hotel adjacent to a convention center, was truly impressive, spanning many decades. There were pinball tables from at least as far back as the late 1950’s up through Stern showing off their newest heavy metal-themed machine, Iron Maiden. Some shooting gallery and other mechanical machines looked even older, and would’ve been right at home in the Musée Mécanique. The newest, and oddest, non-video game at the show was a fully playable Pong-themed coffee table. On that note, as far as video games went, most eras and genres were represented in one form or another, though the heaviest focus was on 80s titles. 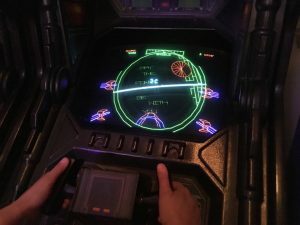 Amongst others, there were sections devoted to vector games, Pac-Man and its spinoffs, Japanese rhythm games (including a handful of recent titles), and cocktail cabinets. Throughout the afternoon, with the odd break every so often, we bounced between these rooms and a small console freeplay area upstairs. I played a fair amount of pinball in high school, so naturally, one of the main things I was interested in were the pinball tables, particularly the 90’s era solid state machines I’m most familiar with. The game I played the most of back in the day, The Addams Family, is arguably the most popular pinball machine of all time, but as there was only one example of it on the show floor, I wasn’t able to play it on Saturday. Instead, I played a game here and there of some old favorites, such as the still spectacular Attack from Mars, which is flashy and laid out in all the right ways. It’s one of the best-designed pinball machines of its time, and holds up very well today. Also impressive was another famous machine that I played for the first time on that day: Eight Ball Deluxe. 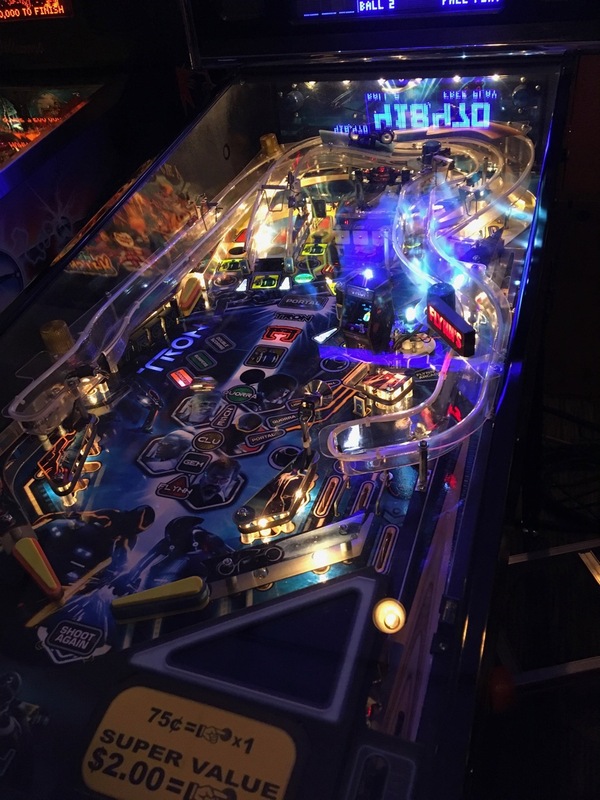 It’s on the older side, dating from 1981, but the playfield isn’t as steep as on its 90’s brethren, making for a slightly slower, more relaxed pace of playing. 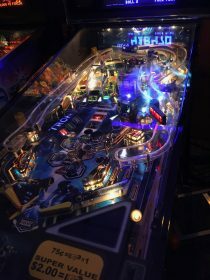 There were a handful of other pinball games we played, most of which were less memorable—or memorable for the wrong reasons, like Elvis, which had a too-crowded upper playfield—but the last game we played was also one of the best. This was the TRON Legacy Limited Edition, which did its theme justice and was fun to play on top of that. On the video games side, I messed around with classics such as Arkanoid (spoiler: I am forever bad at Arkanoid), Battlezone, Crystal Castles, and the truly bizarre Journey, but the most fun games were the ones I didn’t expect. One of these was Atari’s Star Wars, in the vector games section. Perhaps this shouldn’t have come as much of a surprise, since Star Wars games are never not fun, but this one was especially impressive. Playing first-person as an X-Wing pilot, I shot down TIE Fighters and took on the Death Star (this part was surprisingly tough), then tripped up the legs of AT-ATs, all of which were lovingly rendered in green vector lines. Another classic game I enjoyed was during one of our breaks: a cocktail cabinet version of Ms. Pac-Man. As a massively popular old arcade game, it can be tough to find a Ms. Pac-Man in good condition, but this one was impeccably cared for, which made playing it more fun than frustrating. In fact, it was about as relaxing as Eight Ball Deluxe, and I managed to clear a few screens before running out of lives. In the rhythm game section, somewhere in between Taiko no Tatsujin 14 (as fun as you might expect) and Theatrhythm Final Fantasy All-Star Carnival (which has a rather strange control scheme), metaly introduced me to Music GunGun 2. This game is a mashup of the shooting gallery and rhythm game genres that works surprisingly well. In it, one shoots at large bulbous notes on the screen in time to the selected song to beat a robotic enemy hanging out in the background. It would be neat to see this ported to a home version, perhaps as a touchscreen-based game. 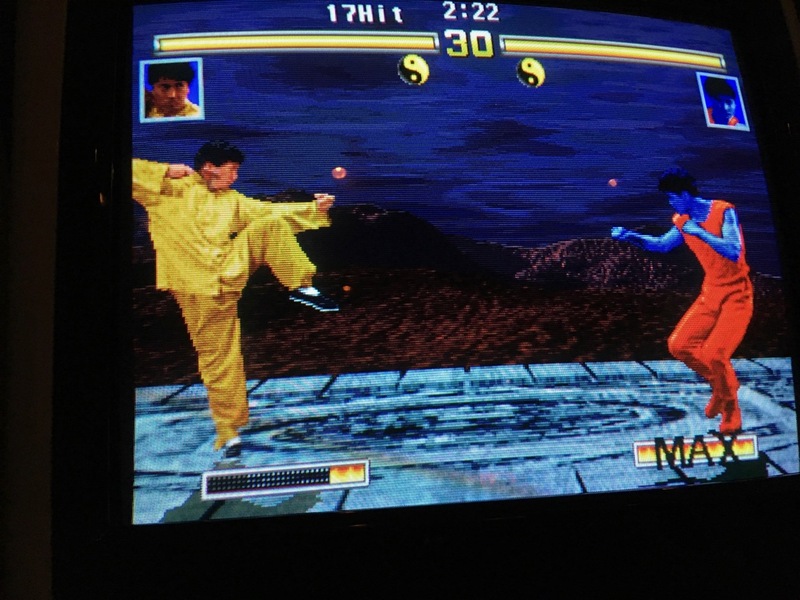 Another Japanese game I enjoyed, a short ways away in a row of Astro City arcade cabinets, was Crimzon Clover, a Cave-style vertical danmaku shooter; nearby, bitprophet amused himself with the fighting game Jackie Chan in Fists of Fire. A different section housed an even newer danmaku game, Aka to Blue Type-R, with its developers on hand and soundtracks for sale, and a little ways to its left was an unreleased Sonic arcade game, SegaSonic Bros. The latter appeared to be a puzzle game where the goal was to create ring shapes out of the multicolored falling Sonics, and watching bitprophet play, it was easy to see why it was never released, as it’s not very good. There were some other notable things that we saw, such as a Typing of the Dead-styled Lupin III game and a cabinet housing a port of sorts of Spacewar! It’s also worth noting what we didn’t see. Konami four-player beat-em-ups like The Simpsons and X-Men, which were hugely popular in the 90s, were noticeably absent, and other quirky genres, like FMV games, were in short supply as well. Dance Dance Revolution knockoff In the Groove 2 was there, but not any form of DDR itself. Meanwhile, there were multiple copies of a handful of popular games, some of which, like Asteroids, seemed largely neglected. It would’ve been nice to see more show space dedicated to more individual games, and less repetition, but I suppose that CA Extreme is limited to what its contributors are willing to bring. On another note, there were a few machines that became unusable at any given time—as a minor example, my ball became stuck while playing Eight Ball Deluxe, and I was unable to tilt it loose—though there was also people regularly fixing machines right on the show floor throughout the day. Even though we’re not itching to make California Extreme an annual tradition due to the expense, not to mention the lack of food options near the Santa Clara Convention Center, we had a fun time. This was our first year attending, and it managed to be a packed day of retrogaming with friends and hundreds of other like-minded folks from the Bay Area and elsewhere. We left as the sky darkened, smiles on our faces, thinking back on everything we had seen. The following day was spent at home resting our feet, but not necessarily our hands, as there’s always games to play, no matter where we are.